CNA—In a rare new letter penned by Benedict XVI, the retired pontiff said he is in the last phase of his life, and while his physical strength might be waning, he is surrounded by a “love and goodness” that he never imagined. 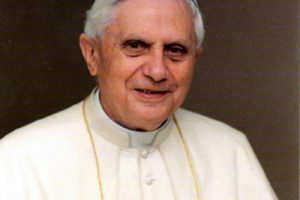 “I can only say that at the end of a slow decline in physical strength, inwardly I am on pilgrimage home,” Benedict XVI said in the letter, published Feb. 7 in Italian daily Corriere della Sera. Benedict addressed the letter to Italian journalist Massimo Franco of Corriere della Sera, who was charged with the task of presenting the retired pontiff with letters expressing concern and asking about his well-being five years after resigning from the papacy. He shocked the world when he announced his resignation Feb. 11, 2013, declaring that the See of Peter would be vacant as of 8 p.m. on Feb. 28. A conclave was called to name his successor, and on March 13, 2013, Jorge Mario Bergoglio was elected Bishop of Rome, and took the name Francis. He said he considers the questions and concerns of the readers part of the love he has experienced, and sees them as “an accompaniment” on the last phase of his life.